The advantage of living in the South, is that we have plenty of winter visitors. Goldfinches have returned after not stopping by in about two years. I quickly went out to buy fresh Niger seeds as soon as they arrived. 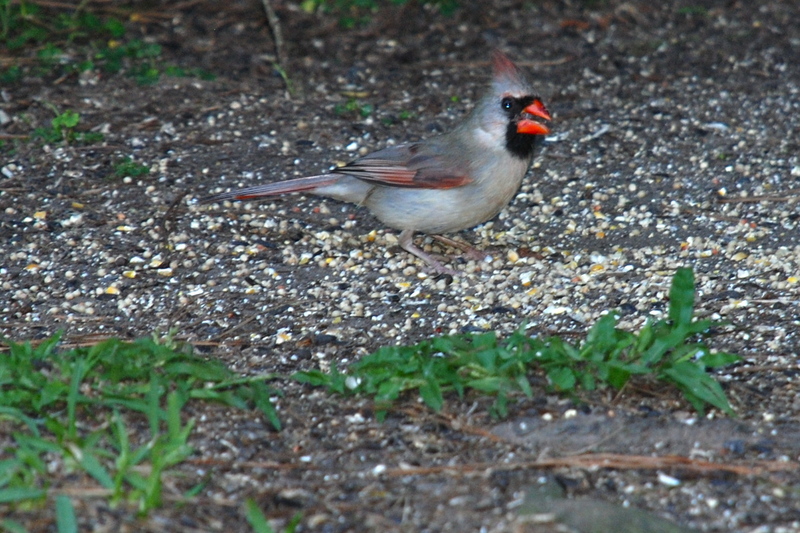 The resident Cardinals don’t seem to mind sharing sunflower seed with the visitors. 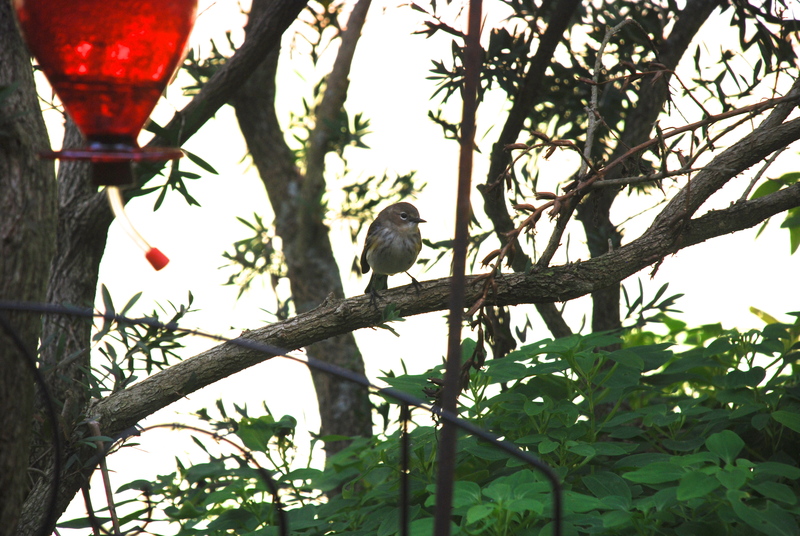 A small flock of Sparrows have also been frequenting the garden. 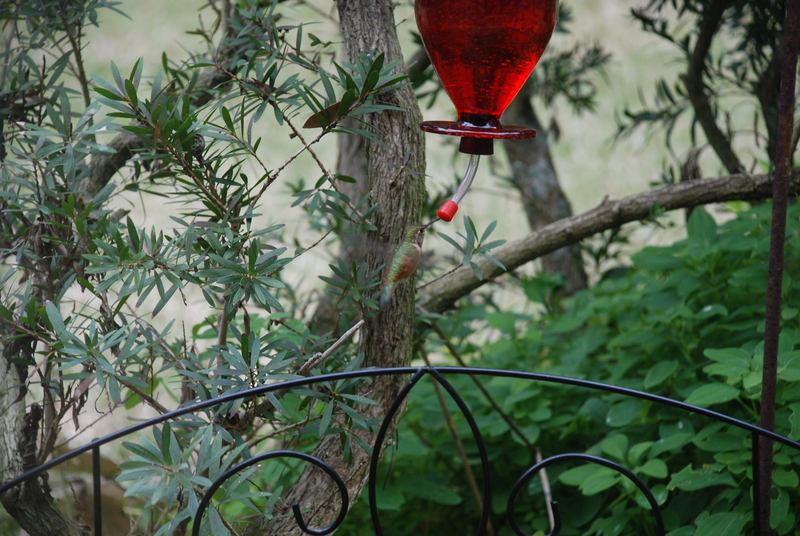 Every year there seems to be a hummingbird in the yard and one finally showed up after Christmas. I believe this is a Rufous Hummingbird, but it really does not have much color. I have been trying to get a photo for days and I finally pulled a chair into the backyard and waited. It didn’t take too long to snap this one from a distance. The day was sunny and the sky was Texas blue. When this photo is enlarged, leaf buds can be seen. Here in Texas spring is not far away and plants will be leafing out next month. Unfortunately, the sunny day inspired this yellow Cloudless Sulphur butterfly to hatch out. I’m not sure it can take the cold nights to come. This was written 3 days ago. See the update on the next post. A new year and and new nest. This year Frick and Frack are building on the porch again. They are trying out the chiminea. The Carolina Wrens picked a location that will be dry and is high enough that cats and raccoons may stay away, but the chiminea is right in the path of humans coming in and out of the garage. Frick and Frack have spent days building the nest. Each takes a turn adding the building materials. The Wrens are using pine needles, mosses and dried leaves. It is hard to get a good photo, but look at the nice weaving of the pine needles. It is amazing that the birds instinctively know how to construct a nest. Some of the materials were just too big to fit. It will be interesting to see if this site will become Frick and Frack’s actual nest this year. The setting is a peaceful garden bed. Sweet little Ruby-crowned Kinglet has been enjoying the sugar water feeder and yummy bugs. And then Yellow-rumped Warbler arrives and sees that Ruby-crowned has a sweet set up. Unfortunately, he can’t quite figure out how to use the feeder. Regardless, he will not let Ruby-crowned use it and chases her off every time she comes near. Yellow-rumped has to get his sugar high from licking the drips from the ground. Meanwhile, the tiny Rufous Hummingbird also has to have his share of the sweet stuff and chases the bigger birds away with his needle-like beak. As I had mentioned in a previous blog, a Ruby-crowned Kinglet had shown up in the garden and I put some nectar out in a hummingbird feeder. I found the Kinglet only likes that shape of feeder tube and needs to have something to land on, as they cannot flutter for long. Male Kinglets have a red tuft of feathers on their heads that they show when startled. They winter here on the Gulf Coast. I have the feeder set up outside my kitchen window and I am entertained while eating or working at the kitchen table. I also took all the photos through the window, which made it difficult to get good shots, not to mention that these birds do not hold still for long. I soon noticed a Rufous Hummingbird using the feeder. It was the first time this winter that I have seen one. These Hummingbirds spend their summers in the northwest, which is why they can tolerate some of our “cold” days. Little tiny Hummingbirds can be quite aggressive and the Rufous would chase the Ruby-crowned from the feeder. And then, the Yellow-rumped Warbler showed up. Usually, these Yellow-rumped stick together and forage in the trees looking for bugs. They especially like Wax Myrtle berries that are now ripe and are probably the reason they are hanging out in the Automatic Garden. This Warbler has developed a bad case of sugar addiction. He comes by several times an hour and the bird does not want to share! 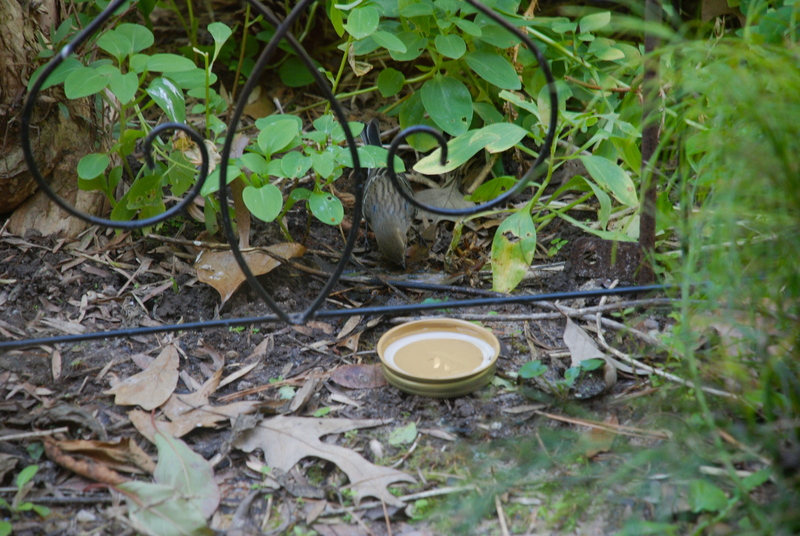 The Warbler knows the sweet water comes from the feeder, but can’t quite figure out how to get it. He has been studying and exploring the bottle for days. As I was writing this, he did try to flutter and drink from the tube, but immediately flew off, so he probably was not successful. The last photo shows a little bit of his yellow rump. When the Warbler’s wings are open the spot is about the size of a quarter. The little actors are still putting on their drama and it is time to fill the feeder so the show will go on! Smart Girl, my favorite cardinal from 2012. This Fall and Winter were unusually silent. Most of the birds were gone. 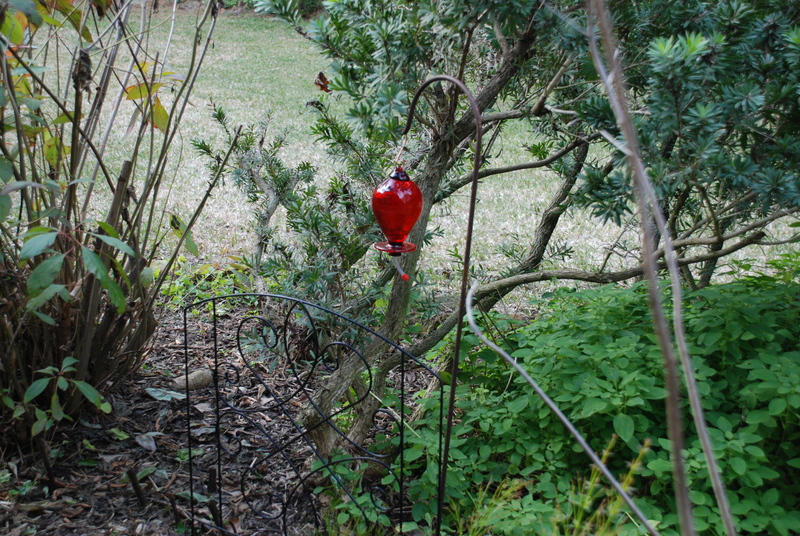 Not only in the Automatic Garden, but all over the area. People had actually written to the city and community papers wondering what happened to the birds. The weeks and months rolled on and the yard was mostly silent. 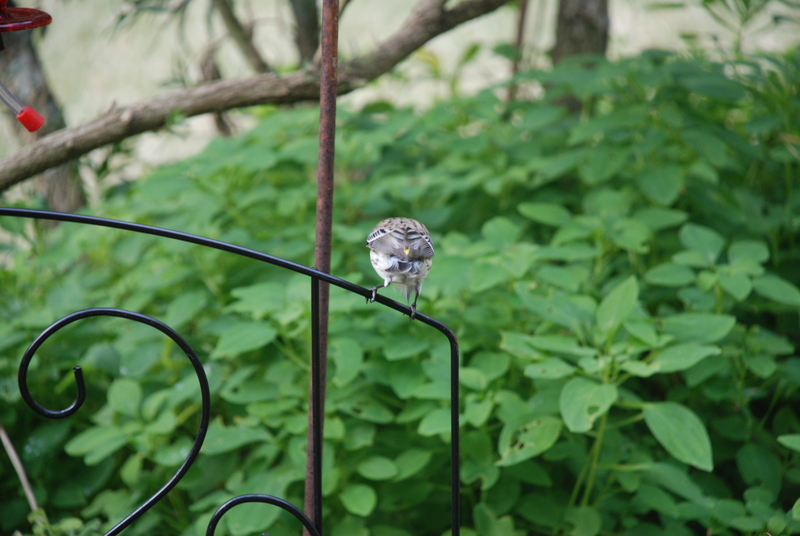 A local bird expert explained that the birds may be changing their territories. All of them? This last week the bird activity finally started to change. The birds are slowly coming back. This morning the garden was filled with the usual variety of local birds along with winter visitors. There was quite a ruckus in the trees and four Red-Tailed Hawks were spotted. It is unusual to see them, especially as a group. They may have been migrating. Shortly after the hawks moved on, there was another ruckus on the other side of the fence. The Barred Owl was out and was being chased by a Bluejay. 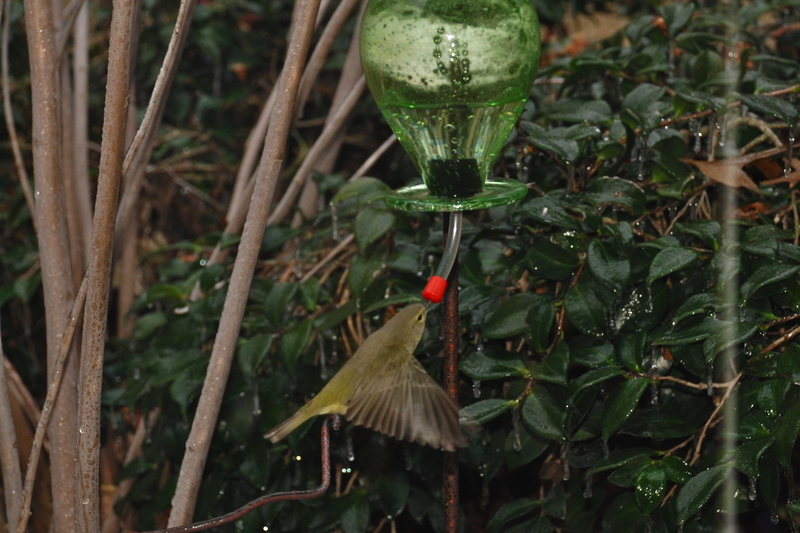 One winter visitor is the Ruby Crowned Kinglet. 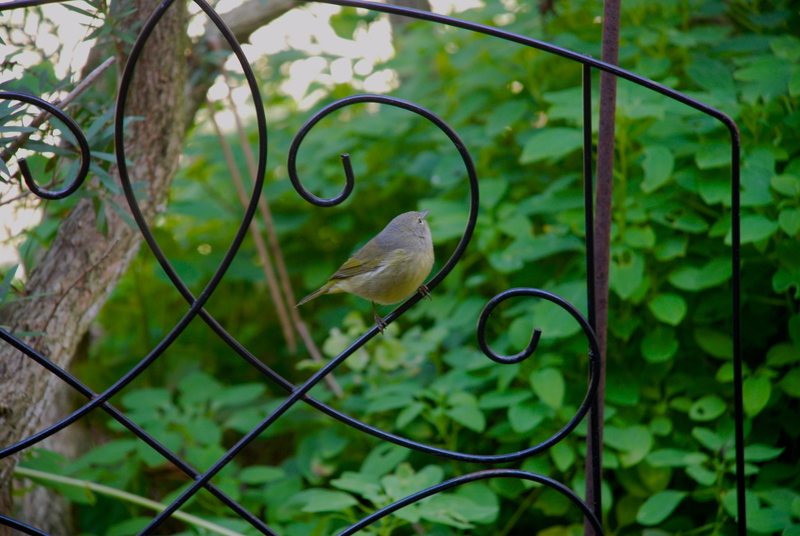 This is an old photo, but there is a Kinglet poking around the shrubs looking for bugs. I hurriedly put some sugar water out for him. It is reassuring to finally have the trees filled with the calling and singing sounds of birds again.